Carpentry Squares are very essential carpentry tools - building things that are square (or at exact angles) is every bit as important as building things that are level. Four of the most common squares that I've used while building just about everything, from small crafts to residential structures, are the framing square, speed square, combination square and the try-square. The framing square and speed square are two of the carpentry squares that I use most often. They are very useful whether you are building stairs, framing a house, laying out a floor for tile installation, or making a picture frame. The framing square, also called a rafter square or roofing square, is an essential tool for laying out stair stringers and for framing roofs. It is available in steel or aluminum and with, or without, the rafter length table printed on it. If you are planning to do a lot of roof framing, and you are frequently cutting hip and valley rafters, I recommend the square with the hip/valley rafter length table printed on it. It can be a real timesaver. 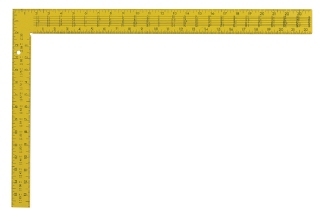 You can use this table to compute the length differences of each hip or valley rafter based on the roof pitch and rafter spacing. 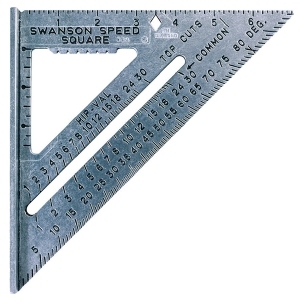 The speed square (shown below) is another very useful carpentry square. One of the many reasons it is so useful is that it fits into your pouch. These squares are perfect for quickly marking 90 degree angles on framing lumber, as well as all of the other angles. The angle indicators on the speed square come in two flavors, degrees and pitch. 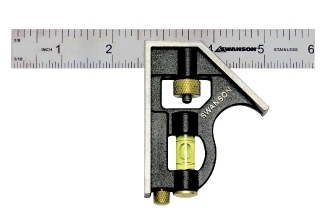 Once you have determined the pitch of your roof by laying out your rafters using your framing square, you can pull this little gem-of-a-tool out of your tool bag and quickly mark the correct angle for your rafter cuts. For example, if you are cutting the angle at the upper end of a common rafter that has a pitch of 5-12 (a 5 inch rise for every 12 inches of horizontal length), all you have to do is pivot the square until it lines up with the "5" mark on the common rafter scale on the square. Make your mark, and cut the rafter pitch angle. The HIP-VAL markings on the speed square indicate the pitch/angle for the corresponding COMMON rafter pitch/angles. You can determine the pitch of an existing roof, by positioning the speed square on top of one of the common rafters and placing a level on top of the square. Rotate the square on the rafter until the bubble on the level is in the center, then read the COMMON mark on your speed square. That's the pitch of the roof. The combination square is a handy little tool that I mostly use in my garage workshop. It has an adjustable ruled blade that you can lock in place with the turn of a screw. You can pre-set it to a specific measurement and use it as a guide to mark other materials that require the same measurement. The combination square also has a built-in level that makes leveling short spans easy and convenient. It also has a 45 degree angled surface for quickly marking 45 degree angles. The try square (I just discovered is sometimes called the tri-square) is another tool that I use in my home workshop. I use it primarily for doing square work where all materials are measured, marked and cut at 90 degree angles. You will get plenty of practice using these carpentry squares as you build the projects featured on this site. 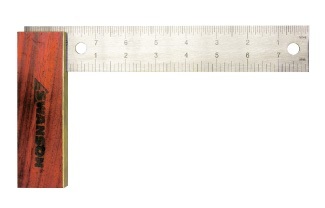 Since the framing square and speed square each have their own unique purposes, they both belong on the list of essential carpentry tools.